AirResource Group has partnered with Raisbeck Engineering adding the superior product line of aircraft upgrades to our growing list of aircraft services. As one of the limited Raisbeck authorized installation centers, we are proud to be a part of this team. See and Be Seen with Boombeam High Intensity Discharge Lights! The FAA has issued AirResource Group LLC its Air Agency Certificate #3AIR745M after undergoing a thorough certification process in maintenance, preventive maintenance, inspection, and alterations of aircraft and aircraft products. 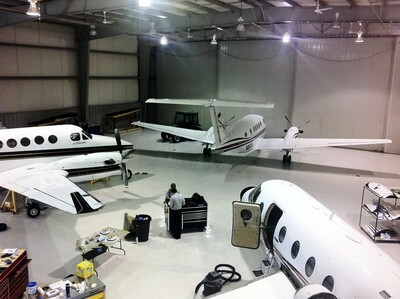 The maintenance, repair and overhaul (MRO) facility centrally located at the Springdale Arkansas airport (KASG) provides complete acquisition, sales and support services for a wide variety of business aircraft. Our award winning and experienced maintenance technicians have a reputation for excellence with an unrelenting focus on safety and customer service. AirResource Group technicians are dedicated to stay current with the latest developments in maintenance protocols to provide the most intelligent and informed solutions to our clients. Simply stated…We have a Passion for Excellence without Compromising Enterprise and Creativity. Due diligence is a must when purchasing an aircraft. Our experienced Maintenance Technicians will coordinate and oversee your prepurchase inspection to minimize your cost exposure while maximizing the value to our clients. Regulations require that all aircraft maintenance be recorded in the aircraft logbooks. An aircraft's value is greatly reduced should logbooks or records be lost or destroyed. SECURELOG® is AirResource Group's proprietary electronic records management service helping owners protect their assets by capturing all important documents in a searchable, electronic database. 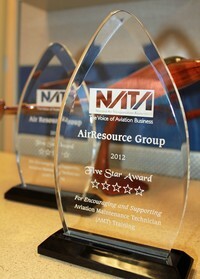 NATA 5 Star Award for SEVEN years straight!